BUILDER Online Sees Value In ASTRALCOM White Paper | ASTRALCOM - Content Strategy, Conversion Marketing and Customer Acquisition. (Lakewood, CA – September 13, 2016) – ASTRALCOM, LLC today announced that their latest white paper, The Digital Journey to a New Home Purchase, has been published by BUILDER Online. BUILDER Online is media property owned by Hanley Wood, is the premier company serving the information, media and marketing needs of the residential, commercial design and construction industry and is a hub of business intelligence and data-driven insights. In reviewing the white paper, BUILDER Online stated that The Digital Journey to a New Home Purchase is a “Worthy piece of work” and will be issuing the white paper on their website as a 5-part series, with the first part available now at BUILDER Online. The white paper is ground-breaking because it clearly defines how prospective homebuyers utilize the Internet to help them reach a purchase decision about a specific brand of homebuilder. It furthermore clarifies the homebuyer journey by recognizing channel syntax and defining appropriate content for each channel and stage of the buyer journey. “Builder Online is the definitive source for all things builder and we’re honored that they’ve published our white paper,” said Richard Bergér, VP of E-Business. “This is exciting for all of us at ASTRALCOM because it serves as recognition and confirmation of our digital marketing philosophies, strategies and tactics,” added Mr. Bergér. In explaining why ASTRALCOM created the white paper, Mr. Bergér said, “Historically, homebuilders have focused their advertising, marketing, content and sales efforts on the tail-end of the buyer journey. With these same processes now on the web, builders should be connecting with buyers earlier and in a more meaningful way, throughout the entire sales cycle,” explained Mr. Bergér. “Yet, many builders still haven’t recognized this, nor adopted initiatives in a way that have significantly increased their sales. That’s because many brands are challenged by the aspects of the buyers’ digital journey,” clarified Mr. Bergér. “As an industry, I feel that we can create a better affinity with homebuyers – by educating and inspiring them, by delivering value along their journey – and consequently selling more new homes. It’s what we’ve been doing as an agency for our homebuilder clients, for more than 15 years, now. It’s what the white paper is all about,” he added. “We feel that the white paper is a worthy piece of work, valuable to our readers, and so have arranged for it to be published in a 5-part series on BUILDER Online,” explained Mr. William Gloede, Director of Content Operations Hanley Wood Residential Construction Group. 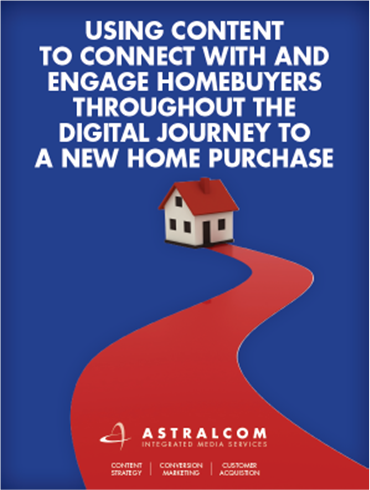 Part One of The Digital Journey to a New Home Purchase is now available on BUILDER Online at: Part 1. To download the full version of the white paper, visit ASTRALCOM’s website.